The Quilting Edge: Low Volume.....Now that's a Scary Thought!!! Low Volume.....Now that's a Scary Thought!!! 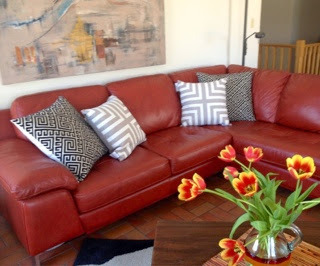 When you buy a red sectional, low volume cushions might just be the way to go. Yup....I went a little crazy today, testing out low volume type cushions. Even my painting above the sectional is fairly quiet. I tried a much brighter painting there, but it was just too much. I really love this particular one, on my low volume chair.......is there such a thing as a low volume chair? Believe it or not I'm actually entertaining the thought of making a low volume type quilt....gasp...I know!!! It's highly unlikely that I will actually accomplish such a feat. My last project...sorry, the one I can't share, is definitely high volume, sounds so much more sophisticated than loud, don't you think?? And, there is a wall, far enough away, from the red sectional, that just might become the home, for that very colour loaded quilt. Scary as it might be for this colour junkie.....I just might be making me a low volume quilt. Remember, I did say maybe. Your low volume choices on the couch work. Well done....great eye. I have also tried to tone down my colour palette this last year... I refer to it as my calm demure side....haven't been very successful. Thanks......I haven't found my "demure side" either. I would directly take the low volume pillow out of your chair. 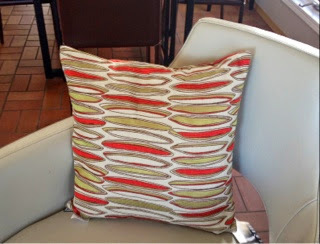 And you can be sure that this pillow would be "high color" between the other pillows on my couch. I would love to see a low volume quilt made by you. I am sure it would be extraordinary. "Be true to yourself"....that's all I'm going to say. I think you could do the same thing with a quilt. Just a punch of color would be awesome! Thanks Colleen......of course I need a punch of colour.......I usually end up with more than a puch though. I am certain you will manage to use light fabrics in a high volume kind of way, and that it will be fantastic. I had to laugh at this post! I have been collecting low volume fabrics thinking that someday I would take the LV plunge. But time and again when it comes to starting a quilt those LV fabrics don't make the cut! BTW, your pillows are great! I had to look twice, that this was actually your post! I love your colourful quilts, but nothing wrong with trying something new....once! You go first! Hehe! The beauty of it is that the contrast of the gorgeous deep red pumps up the volume splendidly! So low volume isn't really low on it. You know, I hope, that even a low volume quilt from your hands will be gorgeous! I have no doubt! Low volume is a relative concept, of course! I keep trying to make a low volume piece but can't seem to get there. My definition of low volume is apparently involves colors that are a step or two down in intensity! What ever you do, I know it will be beautiful. The low volume pillows are a great foil for the red sectional. Now to see that low volume quilt laying on the red sectional. Well, you know how I feel about low-volume... But in all seriousness, I've been such a huge fan of colour for so long and I love the respite low volume provides at times. There is a lot of potential there, get out there and explore!